Finding the best eSports betting websites is not easy. Despite being a huge industry, eSports betting is a new phenomenon and even the largest bookies have yet to master this market. This article will help you decide which operator is best for you. 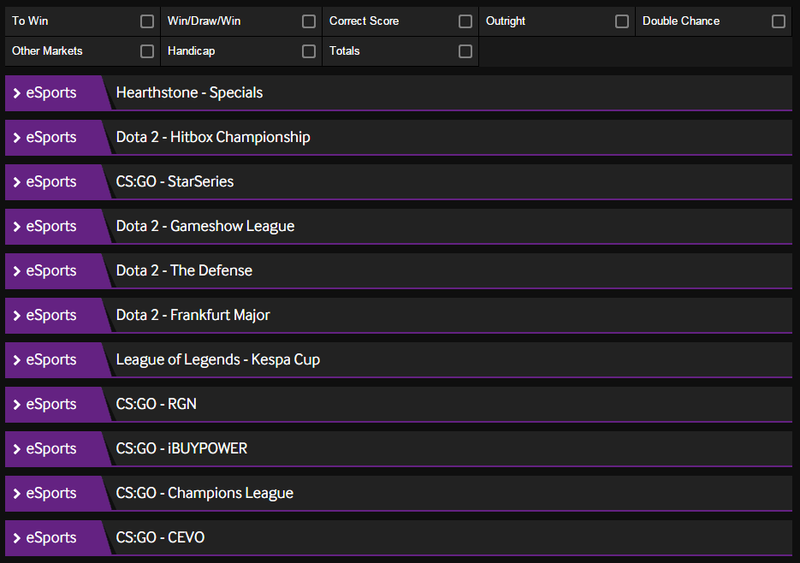 Deciding which esport betting websites to pick is not always an easy task. Between welcome offers, mobile apps and the rest, it’s easy to get lost, especially for a newcomer. But fear not, we’re here to make the task easier! We’ve made a subjective evaluation of the best esport betting websites at the moment, which you can see below. Be sure to consider different options from our partners, to make an educated decision. We hope you’ll find something suitable for you. While the debate still rages over whether eSports really is a sport, the fact is it's here to stay. Every year more money is put into the industry and more people wager on live events. Finding the best eSports betting websites now is a great way to stay ahead of the game and make the most of this while it's still in its infancy. Despite being one of the largest bookmakers in the UK, William Hill's eSports selection is quite small, and it seems as though the high-street fixture is yet to really embrace this new market. 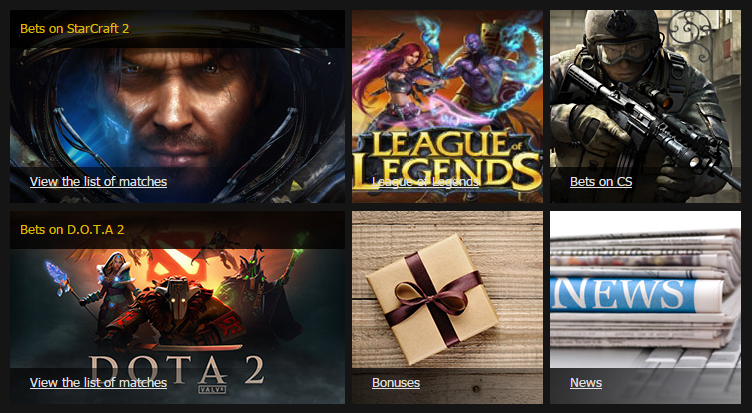 WH offer markets on the four most popular games: CS:GO, Starcraft 2, League of Legends (LoL) and DOTA2. Betting is limited to selecting the outright winner in each match, there is no handicap betting or individual map markets. Verdict: if you want to have an occasional bet on an eSports match as part of your normal betting routine, William Hill will deliver the goods. Bet365 have supported eSports betting markets for over 2 years, however it is only recently that the category was moved to a visible spot on the homepage. The British bookmakers has started to take eSports seriously, offering markets on a host of CS:GO, LoL, DOTA2 and Starcraft 2 matches. Verdict: perhaps not the best option for eSports diehards, but with overall winner and map betting there are enjoyable in-play options. Of all the traditional bookies Betway is by far the best eSports betting website. Unlike its compatriots, it offers markets on games like Hearthstone and World of Tanks, alongside the standard games like CS:GO and League of Legends. The range of available bets is what really sets Betway apart. With the standard outright markets and scores there is also the option for handicap betting and double chance. Verdict: whether an eSports fanatic or a regular punter looking to add a new market to your sportsbook, Betway is a great choice. With the rise of eSports as a competitive industry it was only a matter of time before specialist bookmakers were created, and that is exactly what Vulcun is. Unlike traditional betting sites, Vulcun offers punters the chance to wager in cash or Gold, a unique currency which can be used to purchase in-game items. During live streams there are “loot drops” which gift users a variety of things, from CS:GO stickers to Gold currency. Verdict: for gaming fanatics who want a totally different wagering experience, Vulcun offers exactly that. Click here to get an exclusive Vulcun promo code, courtesy of Betminded. With ‘the global leader in eSports betting' emblazoned on their homepage, Unikrn certainly makes a bold claim for itself. Alongside the main games there are also Call of Duty and Hearthstone markets and similarly to Vulcun, a unique currency, this time called Unikoins. These can be traded in the marketplace for gaming paraphernalia and even top-end gaming PCs. With a huge range of upcoming fixtures and overall winner betting, handicaps and map markets, there is plenty to keep punters entertained. Verdict: for users who want to focus on eSports only, there is no better destination. The marketplace really adds a great extra dimension to the site. Another exclusive eSports bookmakers, however EGB functions more like traditional bookmakers, with cash out options, bonuses and standard currencies. Betting is restricted to DOTA2, Starcraft, CS:GO and LoL, which is unusually confined for a specialist site, however the site does include a News section which helps punters keep up to date with the latest developments. Verdict: neither the best nor the worst. The news feature and cash out functions make it ideal for players who are used to traditional bookmakers but want to experiment with a new market. Much like Betway, Pinnacle mixes traditional betting markets with an extensive eSports selection. Focusing on DOTA2 and CS:GO (but not exclusively) punters can choose between outright markets and handicaps. One of the most helpful sections on the Pinnacle site is the Articles section. 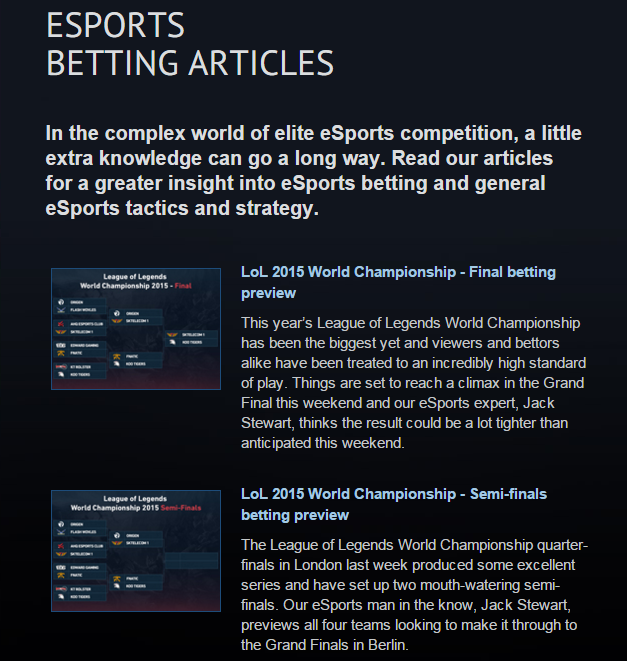 Packed with previews and betting advice it gives punters a really good insight into upcoming matches, which can be difficult to find given the unique nature of the eSports community. Verdict: a great site, let down only by a slightly limited set of betting options. In our opinion Betway is the best eSports betting website. With a huge range of games to bet on, and extensive markets it offers the most options for punters. The main drawback of Betway is the lack of live streaming and in-play on eSports, however with every game streamed live through Twitch, this is easily overcome.